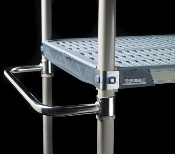 MetroMax Platform Stainless Steel handles for use on mobile units to improve maneuverability and ergonomics. Handles are compatible with MetroMax i, MetroMax 4 and MetroMax Q units. Corrosion proof type 304 stainless steel construction offers long lasting performance. (2) sets of Tri-Lobal Adapters are shipped with each handle. Available to fit 18" or 24" (457 or 610mm) deep units.